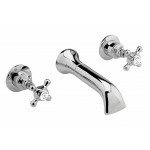 Topaz wall mounted taps are not only functional but are equally beautiful too. They add extra charm to your bathroom with the different designs and shape they come in. These wall mounted taps are completely authentic and you can rely on them easily. Also, they are available at affordable rates so that anyone can install them in their bathroom. Topaz wall mounted bath spout and stop taps have the perfect specification to match any bathroom space.